Believe it or not, tooth enamel is the hardest substance in the body – even harder than bone! You might think that should make it almost indestructible, but if it were, there wouldn’t be any need for dentists. Do your teeth look like this? Do you wish they did? Let’s explore your options together. Of course, proper brushing, flossing and periodic cleanings and exams in our office contribute to a healthy smile. But sometimes, even with the best dental care, you can experience tooth decay, cracked and chipped teeth or even missing teeth that affect the way you look and feel about yourself. And that’s where restorative dentistry comes in handy to correct your smile problem and give you your confidence back! Veneers, very thin covers that are placed on the fronts of teeth to cover and correct gaps, stains or chips. 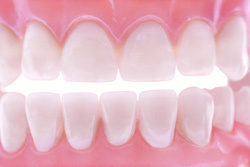 Crowns or “caps” that fit over existing teeth to replace missing or damaged tooth structures. They are commonly used after root canal therapy to strengthen a tooth and with an implant to replace a missing tooth. A dental bridge is made up of two crowns on either side of the missing tooth connected to an artificial tooth, called a pontic, in the middle. Partial dentures that replace several missing teeth and full dentures that replace all your teeth provide removable replacements that look and feel natural. Root Canal Therapy that removes infected tissue from the roots of a tooth below the gum line. If you haven’t had one lately, you’re not aware that there’s far less pain associated with this procedure today. Restorative dentistry is designed to fix the problem with your teeth, relieve pain and pressure and provide you with a natural fit that replaces one, several or all of your missing teeth. Don’t put off coming in because of fear. Dentistry has changed and we cater to cowards! Give us a call today.